I haven't attempted socks yet. I've been doing sweaters for 30 years and lots of scarves lately, moving into lace patterns, but socks just haven't grabbed me yet, plus I'll admit to being a little intimidated by the thought of them, which I'm sure is silly. Hey, there's nothing wrong with not doing socks. Given your excellent example, I have been enjoying myself doing nothing but scarves. And really only one stitch, too. I've finished a few, have a few more mostly done, and am in the middle of two. It's fun, because I can play with all of the different yarns without getting caught up in other, more complicated things. Thanks! And yeah, there's no rules that say You Must Knit Socks. You get to knit just what you want! I didn't think knitting socks made sense given they are so cheap to buy, but then I discovered how happy it makes me to have hand knit socks. Using the dpns (I use circulars for almost everything) and turning the heel. Also, I tend to knit while doing other things, so having to pay attention during increases etc, seems inconvenient to me. I have a sweater that is very close to being done, but I'm at a decrease row on the neckline and just haven't sat down to it with intention in about 6 weeks now. OTOH, my stash has somewhat organically come to include several nice sock yarns, so perhaps I will use one of them for a pair of socks instead of a scarf. You can use two circulars for socks or any tubular knitting. I prefer that method because there's less risk of the yarn falling off the needles. I have some tricks with stitch markers that make it easier for me to keep track of increases/decreases. But I know what you mean about the difference beween knitting you have to pay attention to and knitting you don't. 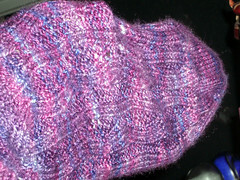 As for turning the heel, it does require attention because you have to count. But otherwise it's not hard; the pattern usually includes line by line instructions. i think it's really cool that you're now at the point where you can just substitute a different pattern and even turn it around for part of the sock when the original plan doesn't pan out. Ooh pretty. Of course with the purple that was guaranteed :-). So, since my lace-obsession has begun giving way to a sock-obsession, would you recommend the Favorite Socks book as a second book on socks? I got the basics from Sensational Knitted Socks but I'm not feeling inspired by that book anymore. I'm also tempted to just Make Stuff Up, but I have this sneaking suspicion that there's more sock wisdom out there I could absorb. Thanks! What sort of inspiration do you want from a sock book? Something more than "here's forty-six more stitch patterns you can use on the instep of your sock!" which is mostly what's left for me in the SKS book. SKS feels like one designer's take on sock construction -- granted, there's top-down and toe-up options, there's a couple of different kinds of toe options, but it still feels like one person's wisdom. I guess I'm looking to deepen my understanding of sock construction. Ethnic Socks and Stockings, Priscilla Gibson-Roberts—Eastern socks, toe-up, with inserted heels, historical, several toes and heels covered. charts. "inspirational". Folk Socks, Nancy Bush—Western Europe socks, history, and patterns based on historical examples. flap and gusset heels. Knit Socks! Betsy McCarthy—patterns, some in worsted weight. tips. suggestions for ways to use self patterning yarns. People have also recommended Cat Bordhi's books (Socks Soar on Two Circular Needles and New Pathways for Sock Knitters); I haven't investigated them myself. My local library has Folk Socks and New Pathways for Sock Knitters so I've put them on hold.